I have a submit button on my page and I believe I have it filled out to submit it to my email but when I send the form to myself the submit button is not showing up. How am I supposed to send the form so they can send back filled out? I'm not sure if I understand your concern correctly. Could you please provide us more details of it? A screenshot perhaps? If you have include the form's URL in you email body, the recipient of it can easily open the form and complete it on a web browser. Here's a sample of it. 1. First, I added the form link on the email content. 2. I then received the email like this, I'll need to open the link to a web browser to fill it out and click the submit button. 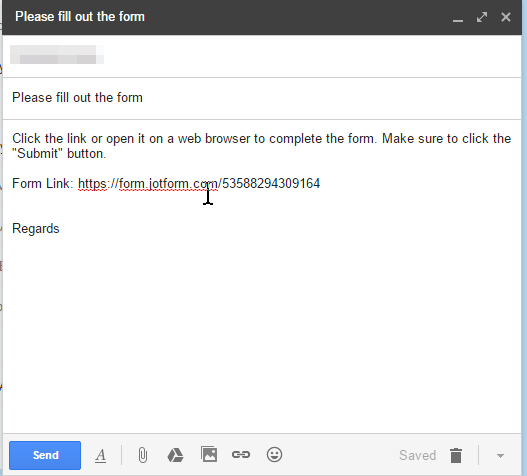 If you are embedding the form in an email template, please note that it cannot be submitted from there. Email client or email software does not load scripts and other resources that is needed to make the form work and submit.